These pasta sauce recipes are outstanding. If you are buying sauce from a can or even bottled sauce, you are really missing out. Any of the recipes below can be used as homemade pasta sauce or spaghetti sauce. In a large saucepan over medium-high, sauté the onion in canola oil until tender. Add garlic and sauté until brown. De-glaze the pan (scrape the bottom of the saucepan with a spatula) with the sherry; add parsley and stir. Put in the remaining ingredients and bring to a boil. Reduce heat and simmer for at least one hour. You will love this Italian pasta sauce recipe. Bring a large pot of salted water to a boil and add the tomatoes. Cook for 10 minutes, drain, and submerge in a bowl of ice water. Remove skins and return to the pot; mashing them. Stir in the tomato paste with 2 cups water. Cover and simmer on low heat. Heat the butter and canola oil in a skillet over medium-high. Sauté the garlic, bay leaves and onions until translucent. Next add the chopped green pepper and mushrooms; slowly cooking for 10 minutes. Add these vegetables to the simmering tomato sauce with the remaining ingredients. Place in a crock pot on low, or simmer slowly on the stove top for 6-8 hours. Season with kosher salt and freshly ground black pepper to taste. 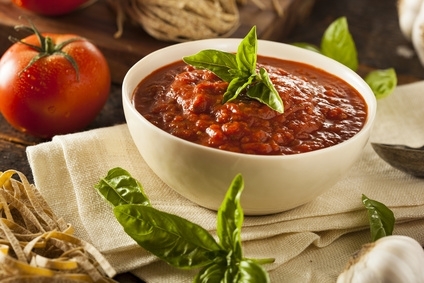 A wonderful, quick pasta sauce recipe. Simply delicious. Heat oil in a skillet and saute the onion and garlic. Stir until lightly browned; approximately 3 minutes. Add the tomatoes and herbs; bring to a boil. Lower and simmer for 10 minutes. Season with salt and pepper. Heat oil in large pan over medium-high and brown the spare ribs. Add chopped onion, onion powder, garlic powder, garlic powder and cook. Stir often until the onion is transparent. Add the tomatoes, crushing them in your hand with juice. Add remaining ingredients and bring to a boil. Reduce heat and simmer for 2 hours, or until meat starts to fall away from the bone. Stir often while simmering. This can be made ahead of time and frozen for a future occasion.